Lithium has been widely prescribed and researched as a mood stabilizing drug, yet it continues to be one of the most slandered and misunderstood therapies in medicine. 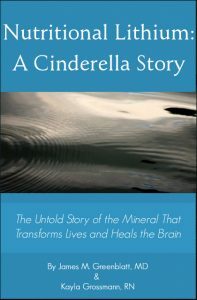 Cast under a darkness and mystery for being one of the oldest treatments in psychopharmacology, what many have ignored is that lithium is not a synthetic chemical or pharmaceutical concoction. Rather, it is a mineral that is essential to human health. Present in trace amounts in the foods we eat and the water we drink, lithium is a critical nutrient for many aspects of human physiology. There is an abundance of research on lithium as a healing supplement for a variety of ailments including mood disorders, behavioral issues and cognitive decline. This booklet provides a review of these fascinating studies, coupled with clinical evidence of the benefits of low-dose lithium therapy.